How Often Should You Have Your Rugs Cleaned by the Professionals? While our carpets and rugs keep our homes looking elegant and sophisticated, proper cleaning must be performed to ensure that pollutants, mold and other dirt particles are not present inside the home. The majority of rug and carpet owners own a vacuum cleaner – one of the most important appliances, especially if your dwelling is fully carpeted. Your carpets and rugs should be cleaned on a daily basis to ensure the cleanliness of your home. Using a Vacuum Cleaner: Is it Enough? Some of you may think that cleaning your rugs using a vacuum cleaner is enough to maintain a dust-free home. It is true that these vacuum cleaners can help you clean your rugs, but this method of cleaning alone isn’t enough. There are dust particles, germs and other debris that is too small for the naked eye to see. These tiny particles most often stay in your carpets, regardless if you use your vacuum on a daily basis. If left untouched, these dust particles can contaminate your indoor air, which can be a major health risk to your family and pets at the same time. Aside from the typical brushing and the use of vacuum cleaners, hot steam, and washing the rugs may be another option to ensure that your home is free from indoor pollutants caused by your rugs. Some homeowners think that doing the carpet cleaning on their own will save them money. The truth is, if not done the proper way, you’re putting your family’s health at greater risk and there are also increased chances that you may damage your rugs altogether. If you’ve washed your carpets and it is not thoroughly dried, the chances of mold hiding beneath your rugs are higher, which can even cause greater health problems. 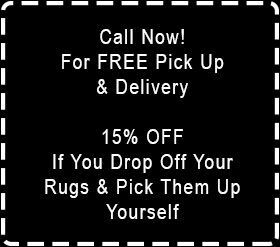 Why take the risk when you can have a professional rug cleaner do the daunting job on your behalf? Experts have suggested that professional rug cleaning must be done at least every 6 – 12 months. This doesn’t just ensure that your carpets’ lives will be longer, but this also gives you the assurance that no hidden particles and unseen mold, bacteria and other pollutants will hide beneath your rugs.